I use all those tools (except crazyegg). I add to it, google adplanner, google insights, keywordspy, seomoz’s tools, seomajestic… that’s off the top of my head. Thanks for the recommendations. I don’t think Google Insights is robust enough to be of much use (still too many cases of “we don’t have data for that”). I used to be a big fan of KeywordSpy, but the flame between us kind of died. Would be interested in knowing specifically which Moz tools you’re referring to as useful for local search; I like a number of them as well. Great stuff as usual Phil! Thanks. Already use ReviewBiz which is great! Will be sure to check out the others. Thanks for the compliments, mate! Would definitely be interested in your professional opinion on any of the others. We use Localeze and you do not mention it in your tools. We are on the fence about it’s effectiveness. I have heard of white spark. Would you recommend it over Localeze? I have seen a competitor to obne of my clients come up on almost every state search in New Jersey. Are there special methods to appear outside your local area on a state search? I take it you’re referring to the paid version of LocalEze? 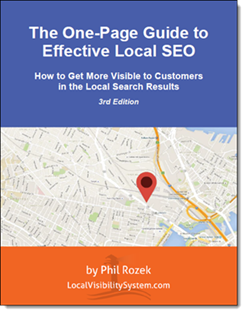 Obviously making sure you’ve claimed your clients’ free LocalEze directory listings is crucial. However, I don’t think I’ve ever used the paid option for my clients. I’m pretty sure you’re in a better position than I am to say how effective it is. Yes, I’d recommend Whitespark: as you know, I highly recommend the Local Citation Finder, but Darren & Co at Whitespark are real pros, so I recommend any of their tools and services in general. Great question about the state search. My best guess is that the way to get visible for queries of “service name + state name” is just to be off the charts in terms of your “prominence” factor. To be more specific: as I’m sure you know, Google itself has stated that its local algo takes into account 3 main factors: “proximity,” “relevance,” and “prominence.” Relevance is probably taken care of: you’re (say) a chiropractor, and the query is (for example) “New Jersey chiropractors,” so that’s a match. Proximity is sort of off the table: the query is for New Jersey, and you are one of a gazillion chiropractors in New Jersey, so that matches up fine as well. At that point my guess is it comes down to relevance: do you have more and better reviews, and from a wider variety of sources, than the next guy? More citations? More and better backlinks? A beefier, more awesome-content filled site? Become the high man on the big statewide totem pole—not just the shorter local one. if it can produce a measurable effect upon my clients Places ranking. Thanks for the kind words, as always! I started using geositemaps for clients only pretty recently, and (as we both know) it’s hard to measure the effect of one factor in Google Places of many, but I’d be really interested in hearing about any effect you’re able to measure. Yeah, that’s kind of a “husbands’ tale.” It’s only true in the sense that slow and persistent is better than fast and sloppy. I’ve found it just takes time to (1) get all the citations to be accurate and (2) to rack up a LOT of them. If you can get a bunch of citations quickly, great, but don’t do it for a couple weeks then stop. IF all your citations are accurate (and that can be a big “if”), then there’s no harm in getting them really quickly. But what you don’t want to have happen is you blast through a ton of citations, and then those citation sites get fed inaccurate info from sources you maybe forgot about, and then you have a bunch of inaccurate citations on your hands and you have to spend all your time cleaning them up rather than getting more. I find it’s just a little easier to go slowly, but you don’t HAVE to. This is my first day of quest on what’s the best way to gather online review, and Phil’s article about the subject has been beyond my expectations! The tactics are clear, the tools are relevant. Thanks much! Is there somewhere I can find info on installing hcard on word press sites and is it that big of a deal if I don’t or can’t? Could not find anything on youtube. the concept is a clean way to structure info. 2. Generate the block of code yourself (perhaps at http://microformats.org/code/hcard/creator) and stick it on every page either by adding a “text” widget to the universal sidebar, or by adding it to the footer.php file (or whatever file manipulates the footer area in your version of WordPress). 3. Generate the block of code yourself and stick it anywhere on the pages manually. Each of these options is pretty easy, but if for whatever reason you can’t do #1 or #2, go with #3. The only reason you wouldn’t start with #3 is it could be tedious if you have a bunch of pages, but if you don’t have a bunch of pages it’ll be quick and easy. If for some unexpected reason you can’t get hCard in there at all, it’s not a huge deal: what counts above all is getting the name/address/phone on every page in a standard format (as though you’re mailing a letter).